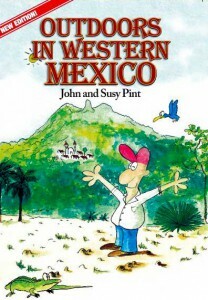 Outdoors in Western Mexico, by John and Susy Pint (2nd edition 2011). Art and Cartoons by Jesús Moreno; graphic Design by Jesús García Arámbula. 212 pages. 41 maps.14 color photos. Too many drawings and cartoons to count. This user-friendly book contains details of forty scenic places to camp, hike or picnic within a few hours of Guadalajara and Lake Chapala. Short descriptions include trail landmarks and background information. A very hard to find book! Need to learn more about this book? Thanks! Copy of this message sent via email. Let us know where book needs to be shipped to and we’ll send you a paypal invoice covering cost of book and shipping, TB.